Daytonian in Manhattan: The Lost Billings Mansion -- "Tryon Hall"
Three years after marrying Margaret Cochran in 1772, Philadelphian John Corbin joined the militia. 1775 was the year of the Battle of Bunker Hill. That year the intrepid Margaret Cochran Corbin followed the troops and her husband. She cooked for the soldiers, did their laundry, and aided the sick and wounded. The Battle of Fort Washington erupted on the cliffs above the Hudson River on November 16, 1776. A “matross,” Corbin was responsible for loading a cannon while his partner fired it. When Corbin’s partner was killed, he took over the firing while Margaret loaded. Then Corbin, too, was killed. Margaret Corbin took over the cannon, loading and firing it throughout the skirmish. The British won the Battle of Fort Washington; but it was Margaret’s cannon that was reportedly the last to stop firing. The heroic woman was taken off the battlefield with severe injuries to her jaw and chest and a nearly-severed left arm. After her recovery she joined the Invalid Regiment at West Point. A century and a quarter following the battle the land overlooking the Hudson River and the New Jersey palisades on the opposite bank was still largely undeveloped. Riverside Drive was still being graded and carved into the landscape. It snaked below the battlefield site which would soon catch the eye of Chicago industrialist and horse enthusiast Cornelius Kingsley Garrison Billings. At 40 years old, Billings stepped down as president of the People’s Gas Light & Code Company in 1901. He relocated to New York City, living in a mansion on Fifth Avenue at 53rd Street, and joined other millionaires engaged in trotter racing at the Speedway in upper Manhattan. The racetrack had been established just three years earlier. 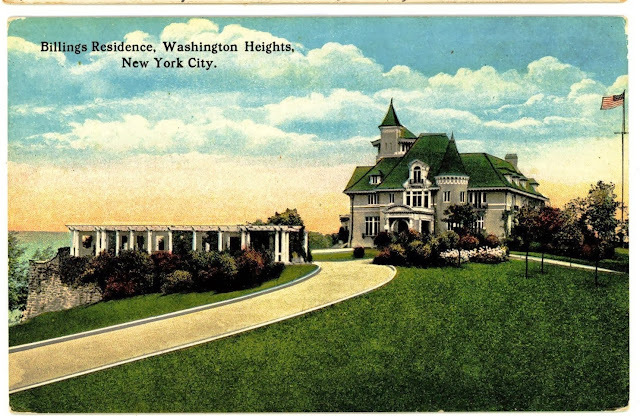 Billings purchased the land in Washington Heights above the cliff, conveniently close to the Speedway, for a stable and lodge. 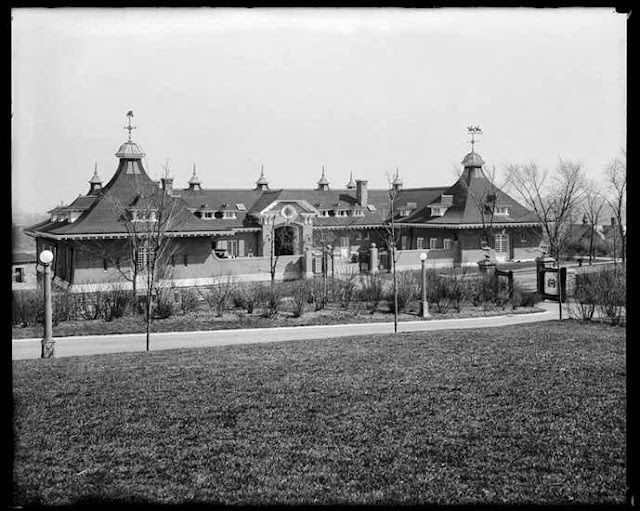 The millionaire commissioned architect Guy Lowell to design his getaway—a 25,000 square foot edifice that coupled a handsome stables and exercise grounds for his thoroughbreds with a lavish casino for entertainment. The country lodge which The Times had described was constructed separately nearby atop the cliff. Construction was completed in 1903 and, to celebrate, Billings planned a dinner in the stables building catered by the fashionable Sherry’s restaurant—the caterer of choice of New York’s wealthiest families. But news of the affair, on which the high-toned guests were to be seated on wooden hobby horses, got out and Billings had to quickly change plans. What the newspaper failed to mention was that the Billings dinner was even more outlandish than was originally planned. Painted backdrops of country scenes hid the French paneling of Sherry’s private dining room and the floor was strewn with hay. The waiters donned the uniforms of grooms, and Billings’ millionaire guests in white ties and tails sat upon live horses around the table. Romanced by the awe-inspiring location, Billings called back Lowell to enlarge the lodge into a year-round residence. The project would go on for years with landscape architect Charles Downing Lay working on the grounds while the mansion was constructed. Finally, in 1907, the complex of buildings was completed. The Sun said of the estate “The Billings place is the finest along the upper drive. Mr. Billings is constantly adding to the attractiveness of his place, which has already cost him well on to the million dollar mark. It is called Fort Tryon Hall, because it rests on the site of the famous revolutionary fort.” The fort had been named for British Major General Sir William Tyron, the last British governor of colonial New York. The mansion itself was a massive Louis XIV-style chateau built around a central courtyard. The New-York Tribune said that around the courtyard were “galleries, from which the dwellers might look down upon a fountain and a garden of brilliant flowers.” In the mansion Billings, his wife and two children, were waited upon by a staff of nearly two dozen. In 1909, in honor of the Hudson Fulton Celebration, the retired millionaire paid for a stele on the property—a monument to the Corbins and the battle that took place on the site. 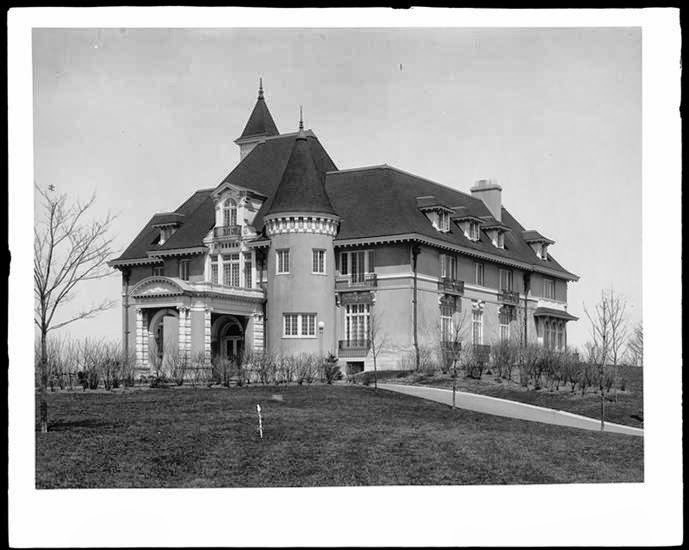 A year after the house was completed, so was Riverside Drive. 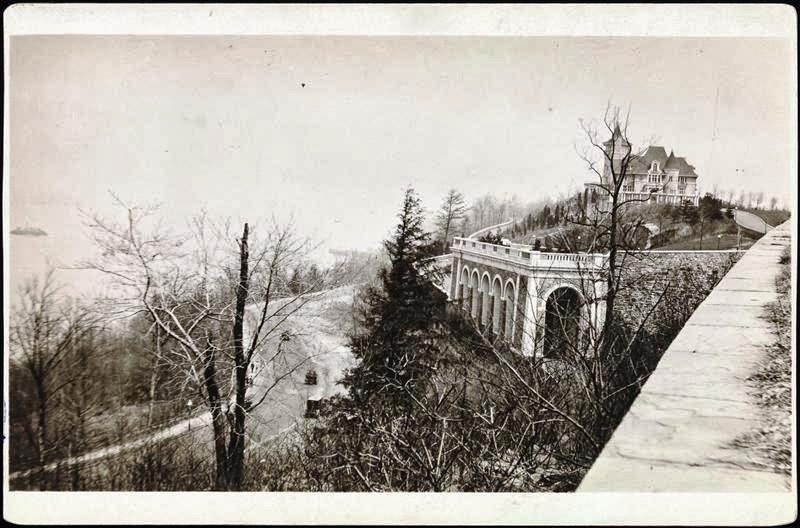 But the steep cliff on which the mansion sat made construction of a viable roadway to the Drive an engineering impossibility—or so it seemed. The west end of the property was 100 nearly vertical feet above the Drive. A postcard captured Riverside Drive snaking below Billings' "Roman Roadway." Inside the viaduct were blind arches built into the retaining wall “to hold statuary if Mr. Billings should wish so.” The sweeping S curve was so gentle that a grade of less than 6 percent was achieved. A balustrade of granite lined the roadway and electric lights illuminated the “Roman viaduct” at night. At the bottom and the top of the roadway were great gates, 20 feet high and ten feet wide that swung from 16-foot high granite pillars. The columns were capped by bronze lamps. The cost of the upper gates alone was $3,000—about $50,000 today. Billings had other homes, as well. 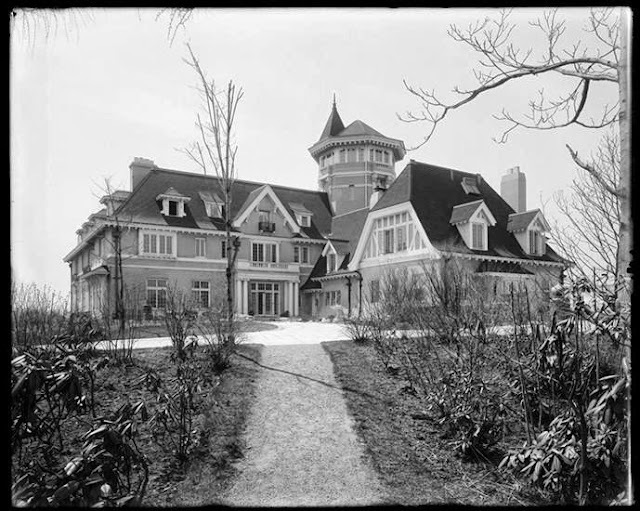 He owned an extensive estate “Farnsworth, near Oyster Bay, Long Island; the several hundred-acre Curl’s Neck Farm on the James River in Virginia; a summer home in Lake Geneva, Wisconsin; and an estate at Colorado Springs. 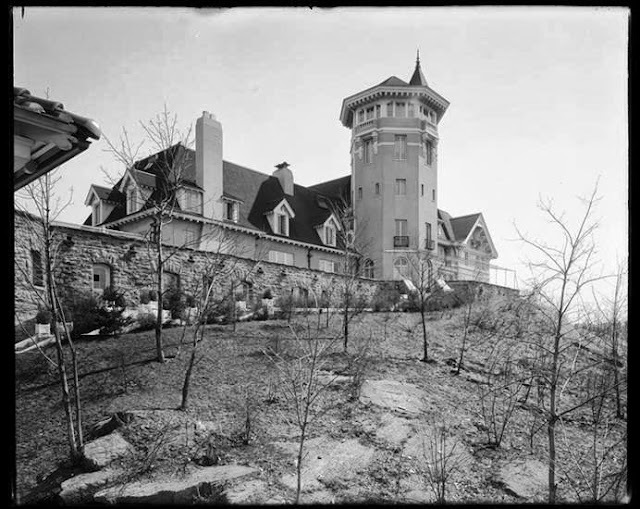 By the time the Daily Ardmoreite wrote of Fort Tryon Hall, Billings was ready to move on. He moved his family into a 21-room apartment on Fifth Avenue and 63rd Street, paying $20,000 a year rent (around $25,000 a month today). That purchaser would become known a few days later when John D. Rockefeller, Jr., announced his plan to give the estate to the city as a park. His $10 million vision included the purchase of two abutting estates; as well as the purchase and preservation as parkland the palisades along the opposite cliffs in New Jersey, to ensure that the views would not be defaced. 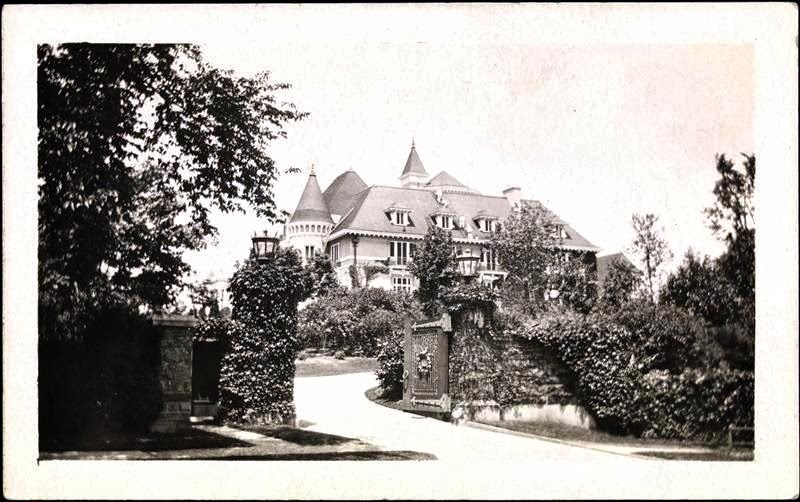 The patriotic plan did come to pass and with the park still in the planning stages, the mansion was rented to Nicolas C. Partos for the summer season of 1918. Partos was head of the Partola Manufacturing Company which made “candied medicine.” His lease extended from May 1 to October 1 and the $25,000 rent included the stables, garage, “other outbuildings, and the swimming pool,” according to The Times. The city dragged its feet and Rockefeller’s dream of an expansive park to the city sat in limbo. Partos’ three-month lease was extended for years—ending on the afternoon of March 7, 1926. Around 3:00 that day a boy noticed smoke pouring from the roof. Inside Mrs. Partos and daughter Irene were both in bed on the third floor with pneumonia. Dr. Henry W. Berg was there attending to his patients. Dr. Berg helped Nicholas Partos and a few of the seven servants in the house carry the sick woman and girl downstairs. They were put in a limousine to be taken to Mt. Sinai Hospital. Before the limo left the property fire equipment had arrived; but by now the smoke had erupted into a full-blown blaze. Cornelius Billings had had an elaborate self-contained fire-fighting system installed on the grounds. 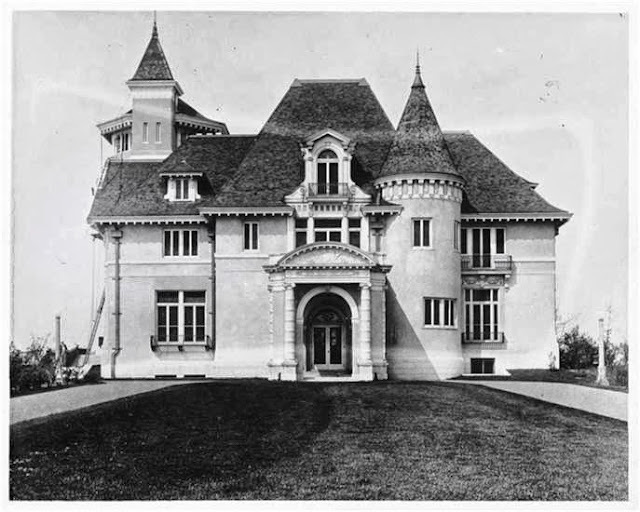 But according to The New York Times the following day, “it broke down at the first trial.” City fire hydrants were 200 feet from the house and, because the mansion was 250 above sea level, the water pressure was weak. Pumping engines were called for and, in the meantime, the house continued burning out of control. While Partos hurried to the hospital to be with his wife and daughter; more than 200 firemen arrived at the conflagration, along with more than 50 pieces of apparatus. Thirty streams of water were focused on the blaze, but the fire continued well into the night. The magnificent Tryon Hall, described by The Times as “a huge rambling chateau with towers and turrets, conical steeples, oriel windows and great expanses of steep shingled roof” was reduced to a pile of smoldering rubble. 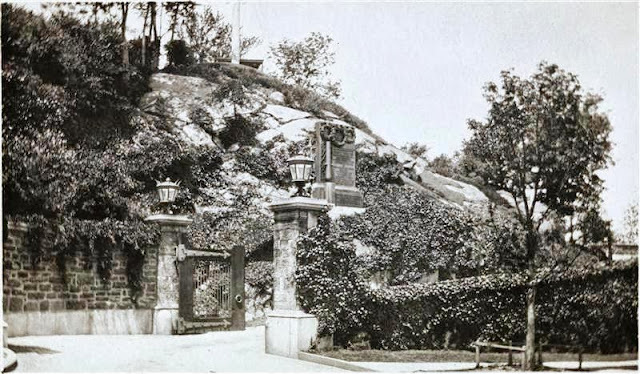 It was not until 1927 that Rockefeller was finally able to start work on his 67-acre Fort Tryon Park. He brought in Frederick Law Olmsted, Jr., son of the co-designer of Central Park, who spent four years transforming the rocky terrain into a manicured landscape. 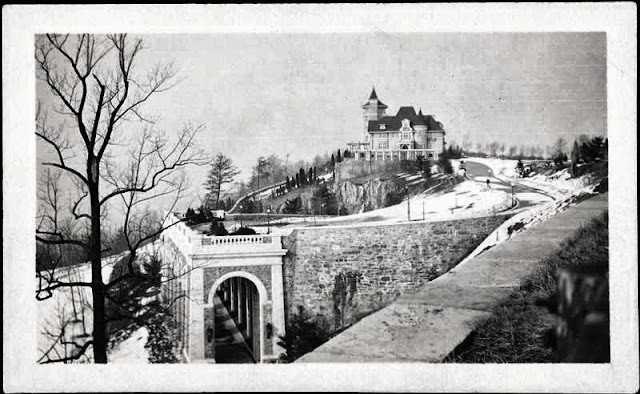 Eight decades later the last surviving remnants of Tryon Hall are the Billings gatehouse, the elegant entrance pillars and the wonderful Roman roadway. This was in Manhattan? An amazing place for sure. What incredible topography and location for an estate and in New York City to boot! 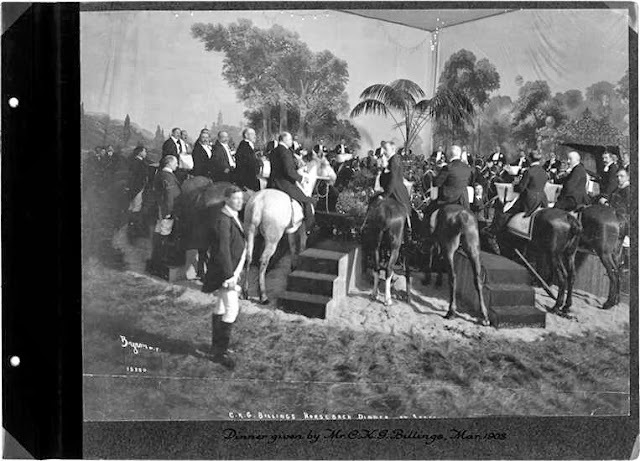 Even though I researched Billings for a piece on his dinner on horseback (found the menu in a Sherry's archive) I learned more here. That picture has fascinated me since I was a teen and Billings was quite a character. I read about the fire in a NYT piece of the period... how sad that it was destroyed. Great piece. Love the photos. Glad you enjoyed it. Billings was, indeed, a character and had the unlimited funds to do whatever he wanted. Other than his famous horse dinner, he like so many multimillionaires of the last century has fallen into obscurity. The general public tends to know only the Rockefellers, Vanderbilts, Astors, Carnegies and the like. Hello living actually in France ( Thonon les Bains in Haute Savoie )I've lived in Washington Heights from 1951 till 1967 with my parents when I was three years old. They gave birth to my sister Cathy . Thank you so much for posting this. A family member died fighting the fire and this documentation is of great value to us. Does the guest list for the horseback-mounted banquet exist? Particularly interested if Andrew Carnegie, Henry Clay Frick or Charles Schwab attended.